Is your coil primed properly? When you delve into the world of vaping, the flavours that are available are quite possibly limitless. But before you get carried away in the process of choosing your blends or single flavoured e-liquid juices, there are a few technical aspects you should consider; I know, what a buzz kill. But the good news is, by priming your coil properly means you can get the most out of your e-liquid flavours. You can look at ‘priming’ as the warm-up before the main act but trust us when we say it’s worth the wait. This small process involves ensuring that your cotton or wicking material inside an e-cigarette heating a coil is sufficiently wet with e-liquid before you start to vape with it. If you don’t you could end up with a dry hit and if you’ve read our first instalment of the vaping bible, you will know that dry hits are the worst unless getting a mouth full of an over-roasted coil is your thing. Each vape device is different and naturally, this means that some of the internal designs are also different, especially newer coils. Sometimes, they can take longer to absorb and sometimes they can take up to no time at all. To reduce the chance of experience a dry hit, we’re going to let you in on some Smokey secrets in order to prime your coil to perfection. The more you use your vape, you will slowly begin to see the amount of vapour production decreasing. If this happens and the taste of your e-liquid juice is less intense, it may be time to change your coil. At this stage, it’s easy to simply fill the tank, screw on the new coil and begin vaping. Our advice to you; don’t do this. Priming your coil means you get a better flavour, better vapour production and overall, better experience when vaping. Step 1 – Attaching your new atomizer coil. Before you do anything, start with getting rid of your old coil. Screw your new coil into place before adding your e-liquid juice. This will give you something larger to hold onto when you’re adding your e-liquid to the coil. By doing this, you stop the e-liquid from getting onto your fingers; if you screw it on after the wick has been absorbed, you might get it all over your fingers. 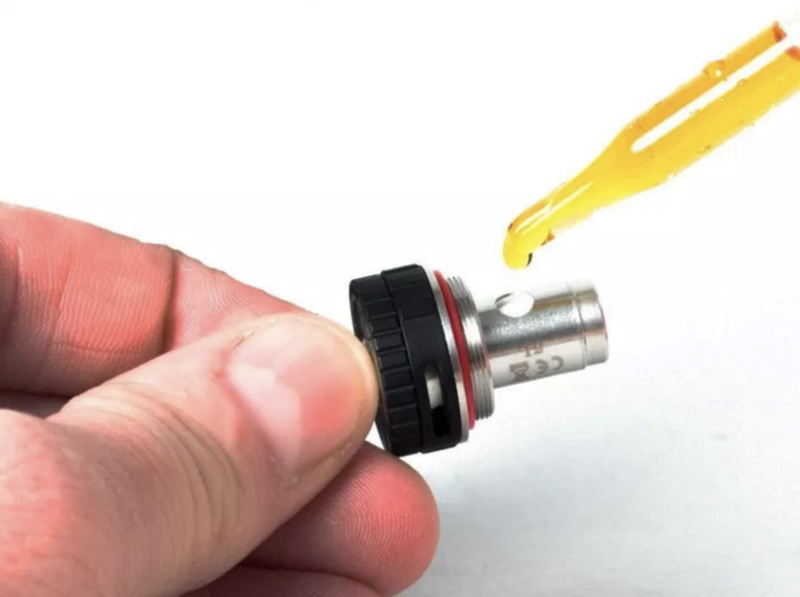 Find the juicing holes that are located on the body of the atomizer head; where the wick makes contact with the e-liquid. As mentioned earlier, all vaping devices are designed differently. You may have a vaping device that has coils designed with the cotton sticking out, while others have the wick behind them; either way, you will be able to find it easily. Add a couple drops of e-liquid juice in each of the holes to make sure the whole wick is covered. Next, we need the cotton to absorb with e-liquid juice. Remember, depending on the specific atomizer and cotton you are using will need different amounts of e-liquid juice. Smaller atomizer coils, such as the Aspire K1/K2 BVC Coils, will require a drop or two of e-liquid, whereas the substantially larger heads that operate with the tanks, such as the HorizonTech Falcon Coils, will require much more to accomplish this. Step 3 – Take a few gentle draws without pressing the fire button. Once you have filled up your atomizer, reassemble the tank and attach it to your battery. If you take a few hits without pushing the fire button, this will speed up the priming process and help pull the liquid into the coil. You draw from the mouthpiece as normal but you don’t press the battery button. Simply tighten the airflow valve (if your tank has one), cover the air intake holes with your hand, and take four or five normal drags. The most important step is priming your coil, however, you need to ensure you break-in your new coil. This is because the wire expands when heated and contracts when cooled, so it’s best the wire gets a little practice. Start by using a new coil at a lower wattage and after a few hits, gradually increase the wattage until you reach your normal power setting. It also helps if you take shorter drags for the first 10-15 so that your wire isn’t excessively heating up at first. Be careful not to drown your cotton as this can cause flooding. A little sign we look for is when the cotton stops immediately absorbing the e-liquid juice. This usually means you’ve added enough. If you’re not sure, give us a shout. We don’t want you to end up with a mouth full liquid. Remember, you want to prime your coil, not drench it. Remember, if you experiment with loads of different e-liquid flavours and come across a few that you’re unsure of, it may be down to the priming of your coil. Before you choose your e-liquid juice, get familiar with priming your coil and you’re already halfway there to getting the perfect vaping experience.